One complete repetition of the motion is called a cycle. The duration of each cycle is the period. 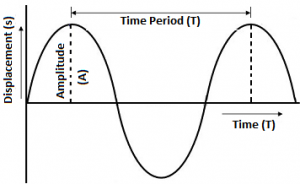 Period is the duration of one cycle in a repeating event, while the frequency is the number of cycles per unit time. Any motion that repeats itself after regular intervals of time is known as a periodic motion, and the time required for one repetition is called the period, it is represented by the letter “T”. The examples of periodic motion are the motion of planets around the sun, motion of the balance wheel of a watch, a tuning fork or motion of a pendulum if you analyse the motion you will find that the pendulum passes through the mean position only after a definite interval of time. We can also classify the above motion to be oscillatory. An oscillatory is a motion in which body moves to and fro about a fixed position. So, an oscillatory motion can be periodic but it is not necessary. For example, a car moving on a straight road is said to have linear motion. Similarly, the motion of the earth around the sun is circular motion. Here we will be talking mainly about periodic motion. A motion that repeats itself after equal intervals of time is known as periodic motion. Time Period (T): It is the time taken by the motion to repeat itself. So, the unit of time period is seconds. Simple Harmonic Motion (SHM): Simple Harmonic Motion is actually a periodic motion having some relation between the restoring force and displacement from the mean position. Frequency (f): The frequency is defined as the number of cycles per unit time. Frequency is usually denoted by a Latin letter f or by a Greek letter v. Period and frequency are reciprocals of each other.